Cold water can often be a deterrent to scuba divers. 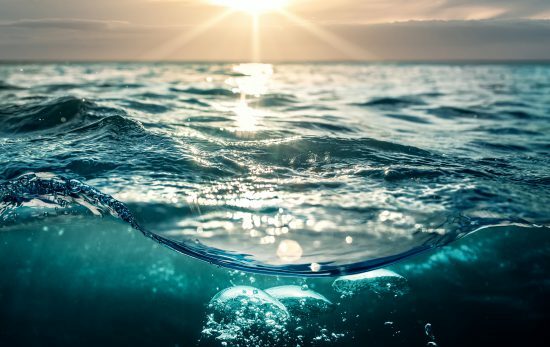 Indeed, chilling winter oceans have their additional challenges – however if you’re into underwater photography, it can definitely pay to face the cold conditions. The biodiversity in cold locations can often be greater than warm water dive sites, with the animals being larger and less commonly photographed. Below are a few tips on why it’s worth bracing those icy conditions and what you might see. 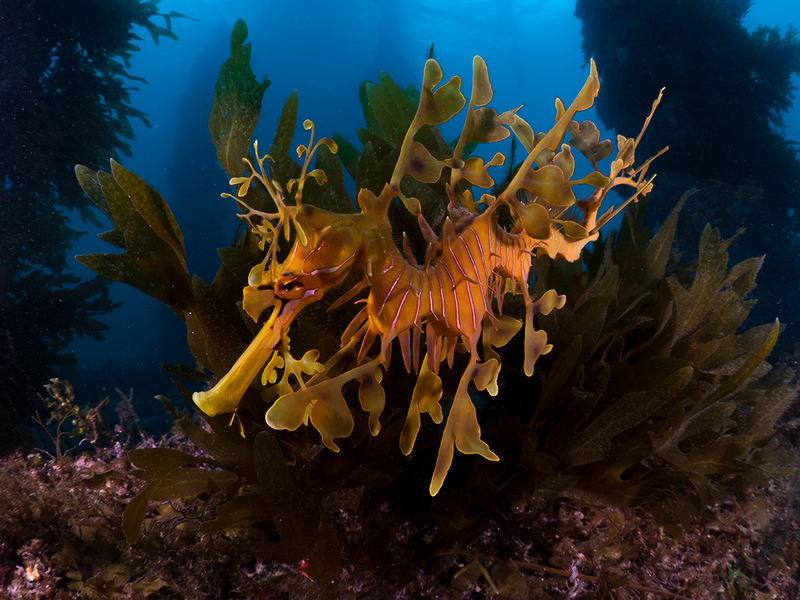 These amazing and curious animals are usually found in chillier areas, hanging around and sun baking on rocky shelves next the ocean. 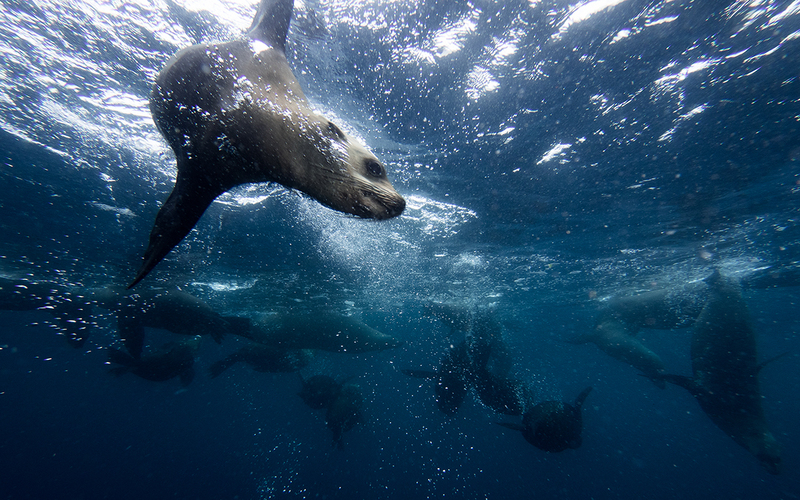 Fur Seals are not only an underwater photographer dream subject, they’re a must see and experience for all divers. The way the come say hello and play a few games with you is a truly unique underwater adventure. With amazing feats of acrobatics they dart around before stopping for a good stare right into your face – the perfect time for a photo or two. Don’t worry though! At no point will you feel threatened. 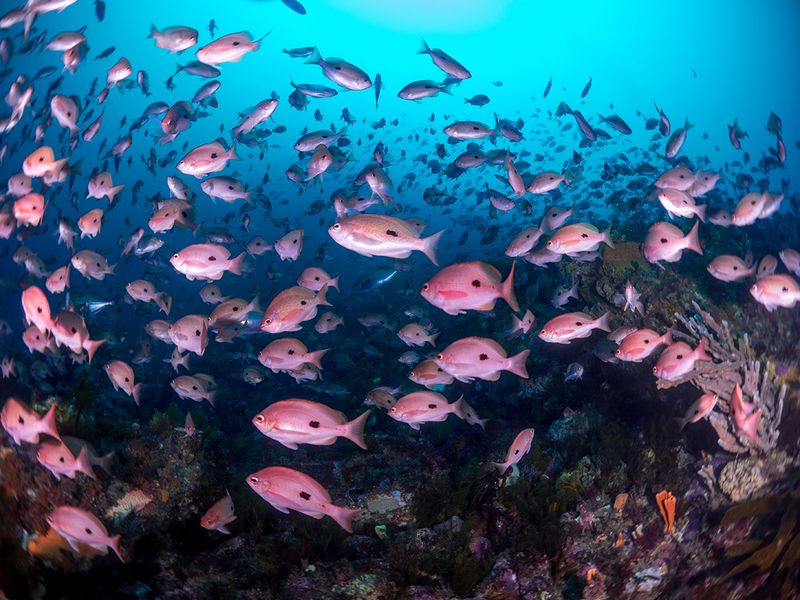 In the southern oceans of Australia and New Zealand, thousands upon thousands of vibrant pink Butterfly Perch form dense schools that sit close to the ocean floor forming curtain like walls. Swimming through them makes you feel like a stage show actor, jumping through an opening night curtain. Load up your wide angle lens and get down past the 30 metre mark to see these beauties. Often they can be found in large numbers around shipwrecks adding great variety to what are already great dives and making for some truly unique photos. 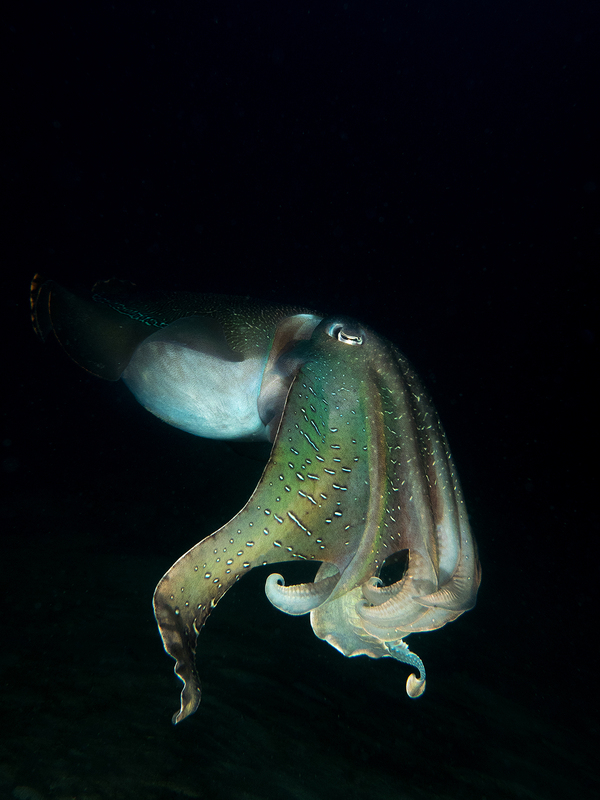 When most divers think of cuttlefish, they imagine small squid-like animals that pulsate with colour and are no bigger than your scuba mask. Visit the cold waters of Australia’s southern regions with this picture in mind and you will get a mighty shock! Here, Giant Cuttlefish are more than happy to come and say hello. Weighing in at over 10kg and reaching over half a metre, they float around with their massive arms, hunting fish and decorating their bodies with colourful displays. An encounter with these behemoths is definitely one for the photography bucket list! When you snap away at these animals, be sure to line the sun up in the background to capture those amazing underwater sun rays – cuttlefish will often pose for you in the perfect location, especially if you are calm and get to know them. 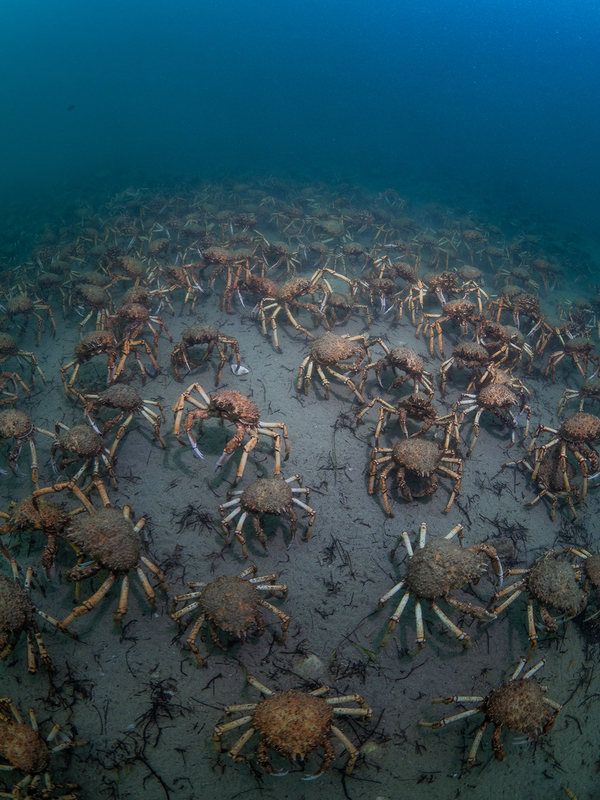 Perhaps one of the most amazing cold water sites that no photographer should miss is the winter migration of Spider Crabs. These football sized crustaceans march into the shallows each winter forming a dense sea floor covering. At the right time there can be tens of thousands of individuals at any one dive site! Indeed you can almost swim in excess of 100m and barely see the ocean floor due to the layer of huge crabs that are slowly plodding along. Whilst the timing the migration right can be difficult, the reward is worth it. Make sure to stretch those strobe arms out wide however as the crabs will always fill your photographic frame! To see more of Matt’s photography, follow his Instagram account or visit his website.